Use Your Dental Insurance Benefits, Before they Expire! 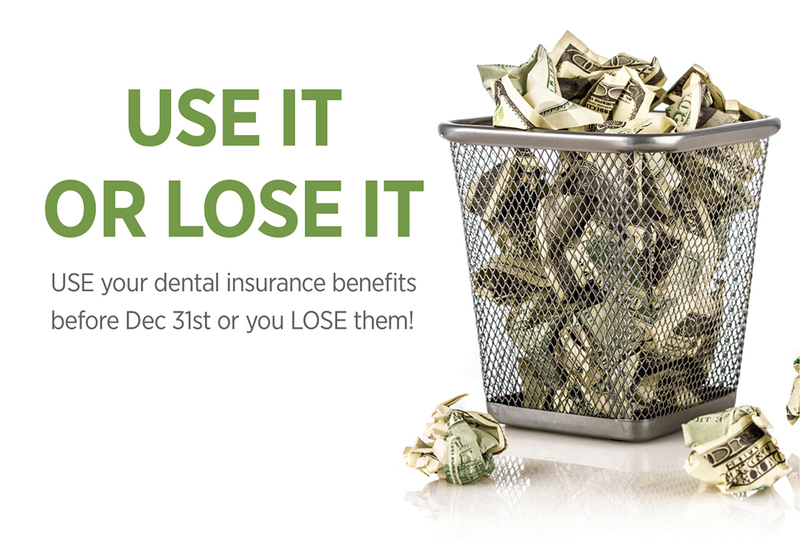 Your Dental Insurance Benefits Only Last the Year, So Make Sure You Use Them! Many individuals receive dental insurance benefits from work, and some pay for their coverage out of pocket on a monthly basis. Regardless of how you are insured, it is in your best interest that you take advantage of your dental insurance benefits. With dental insurance, you are covered for a number of procedures, including cleanings and fillings. However, to ensure that you are covered for particular dental services, it is always best to discuss the provision of your dental insurance with your provider so that you have a complete understanding of the eligible services. Every year, it is essential to make periodic appointments with your dentist. Receiving professional dental care is pivotal to reducing the occurrence of dental issues such as gum disease, tooth decay, cavities, oral cancer, and many other problems. Neglecting dental checkups can extend any oral issues and cause further harm. Although your teeth may appear healthy, visiting the dentist regularly has its significant benefits. Your dental hygienist can help you to identify impending issues and also treat any current ones. Hence, heading to the dentist habitually and utilizing the dental services covered under your dental insurance plan is in your best interest. Dental insurance plans expire. They have a designated limit that is set out as a part of their annual allotment. This maximum total is an indication of how much your provider is willing to cover for that year. If left unused, you will lose that sum for the year, as it will not roll over to cover dental expenses for the subsequent period. If you receive dental insurance through your employer, there are instances in which your coverage can change. In some situations, contracts between the insurance provider and your employer are re-negotiated either to scale back on expenses or to provide more benefits. These modifications regardless of the capacity can affect your coverage. It can either limit your coverage or increase your eligibility of services. Still, it is essential that you consider using the annual benefits for which you qualify before it is too late. Related Article: Need Dental Insurance? Try Cigna Dental. Are you unclear about the dental insurance benefits you have available? Consider contacting us at GPS Dental for assistance. Or, consider reaching out to your dental insurance provider or human resources department if you are covered through work. Overall, do not hesitate to receive the dental care you need. Your oral health is part of taking care of your whole body. Poor oral health is often the foundation of other health issues. Put your well-being first and contact the offices of GPS Dental. Dr. Skrobanek and our team of professionals are equipped to provide you with exceptional care. For more information on dental insurance and how you can use it to cover the dental work received in our office, feel free to reach out to us. We happily welcome new patients and look forward to helping you. We encourage you to give us a call before your yearly dental insurance runs out!